a grizzly story: bear pit long gone! 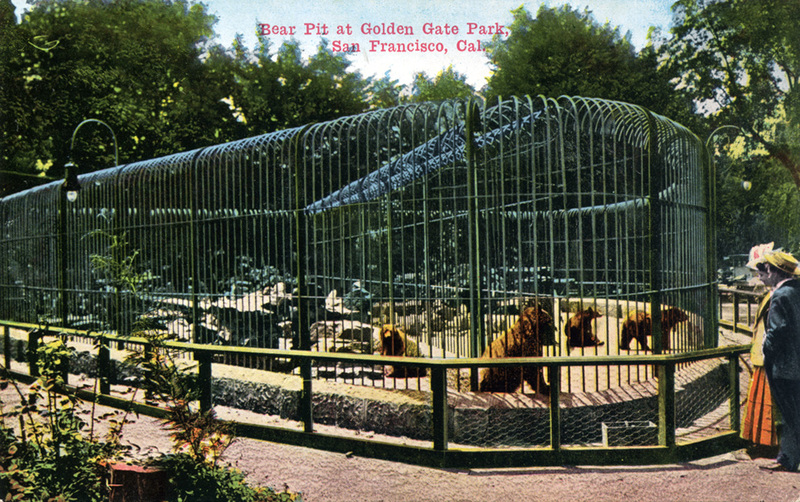 This bear pit was formerly located at the west end of what is now the National AIDS Memorial Grove in Golden Gate Park. It’s one of the more colorful “lost” sites in the park; one that lives on in civic memory though I imagine few San Franciscans would want to see it resurrected. The pit originally housed a famous Grizzly Bear named Monarch, who was the model for the bear on the California state flag. According to Raymond Clary, who wrote about Monarch in The Making of Golden Gate Park: The Early Years, 1865-1906, the great bear was captured in the wilds of the Ojai Valley in Ventura County by a hunting party sent by William Randolph Hearst. The story of Monarch’s capture is grizzly indeed! In May of 1889 Hearst commissioned an expedition to obtain a live bear for the menagerie planned for the park. It took six months of camping in the mountains, building and baiting traps, before the hunters succeeded in capturing a very large bear. But it was no easy task to extricate him from the trap and get him back to San Francisco! After letting the bear sit in the trap for two days (to calm him down?! ), the captors tried making a noose from chains, but the bear’s strength was so great that four men holding the chains were unable to hang on. Finally, “after hours of struggle,” they managed to secure all four limbs and lash the bear to a roughly constructed sled so he could be hauled down the mountain, where a strong cage was made to transfer the bear by wagon and railroad boxcar to San Francisco. The bear didn’t actually take up residence in the park until 1894, when he was exhibited at the Midwinter Fair. When the fair closed, a permanent iron cage was constructed, with bent bars over the top to prevent escape. Monarch the bear lived in captivity until 1911. After his death his body was preserved through taxidery and displayed at the Academy of Sciences for many years. This entry was posted in "lost" golden gate park, history, wildlife. Bookmark the permalink. 2 Responses to a grizzly story: bear pit long gone! A perfect example of how unwise it would be to freeze the park into an fossil in amber. Fascinating article but grizzly indeed. A reminder, though, of how much improvement there was in our treatment of wild animals during the 20th century. Like many of our flagrant human rights offenses, this one could not happen here now, thanks to an enlightenment of sorts on the the treatment of animals. I’m always happy to read such accounts, they show we are inching forward in our humanity.